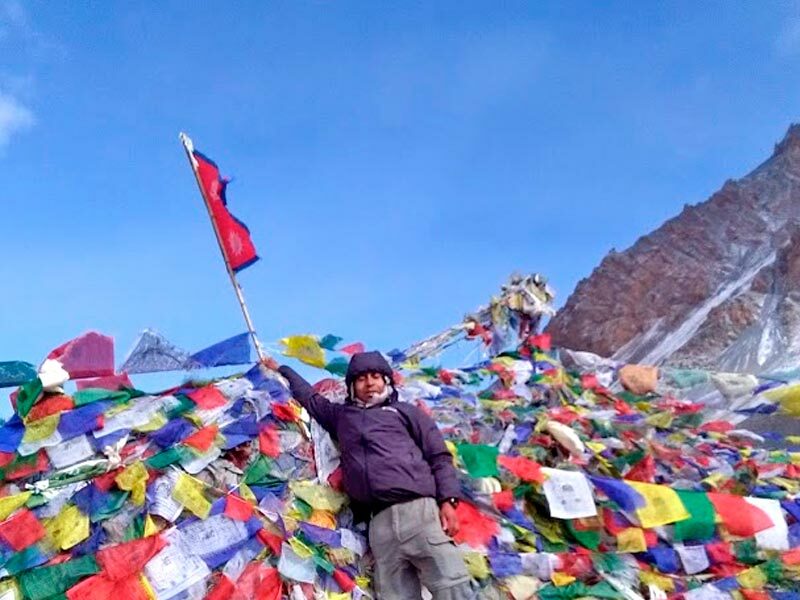 The high point of Annapurna Circuit Trek entails crossing of the 5414 m high Throng Pass, from the arid valley of the upper Manang, home of Tibetan- Buddhists, down to the Hindu pilgrimage site of Muktinath, and the Kali Gandaki valley, the deepest gorge, before heading down to Pokhara. 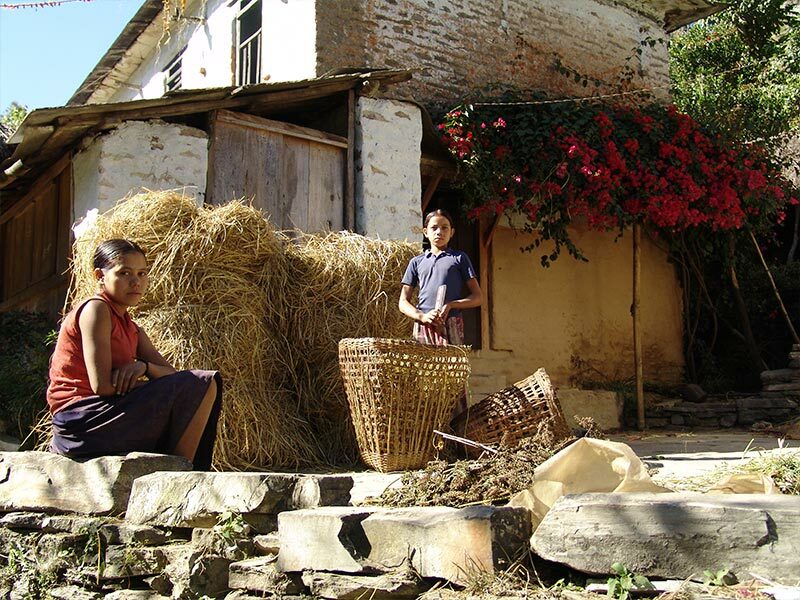 Besides spectacular mountain views, you encounter a variety of mountain communities of the Gurung, Manangi and Thakali people in one hand on the other glorious rhododendron flower. 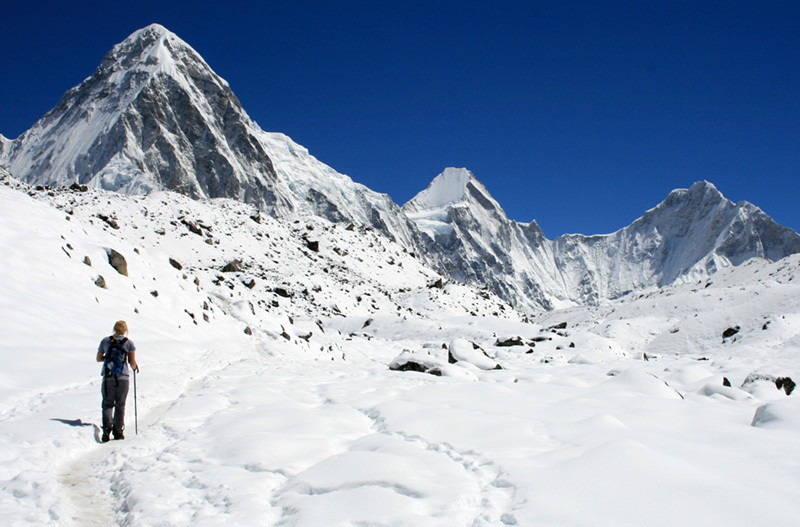 This region is one of the best destination for trekking in Nepal. 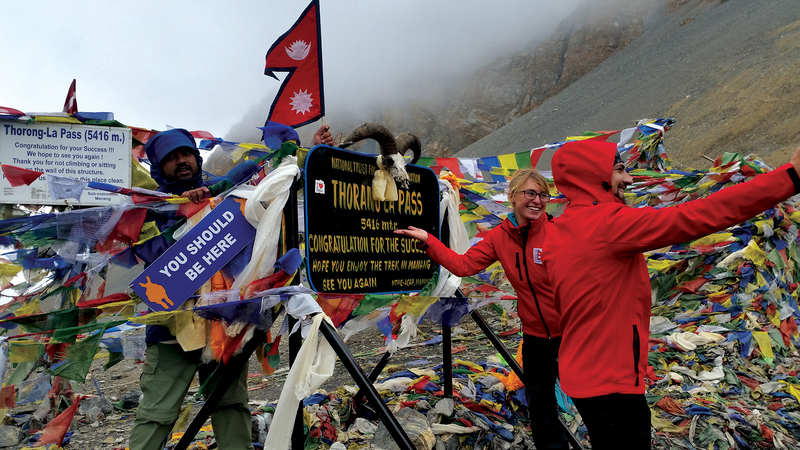 The Annapurna Circuit Trek has been proved as a highly praised and spectacular trekking route in the Annapurna region since it was opened to foreign trekkers in 1977. 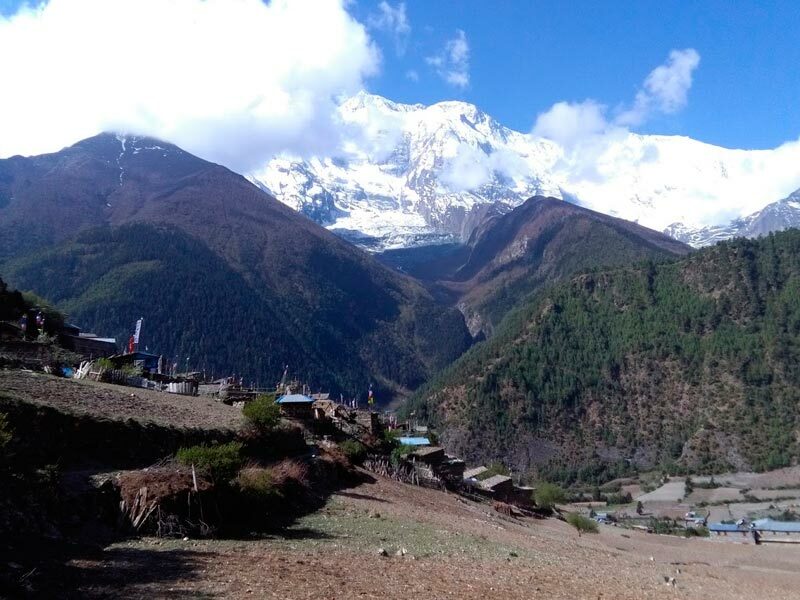 Annapurna Circuit trek starts right from Besishahar and goes along the Marshyangdi River, with great view of Manaslu and Himal Chuli to the east. This magnificent trek leads you to the fine village inhabited by a wide diversity of people from different ethnic groups, offering spectacular and majestic view of the white Himalayas. As it continues to the north of the main Himalayan range on to the high and dry Tibetan Plateau, the scenery is equally breathtaking. This trail now from Muktinath is being a rough road and frequently running by jeep, even though trekking is most excited and enjoyable. 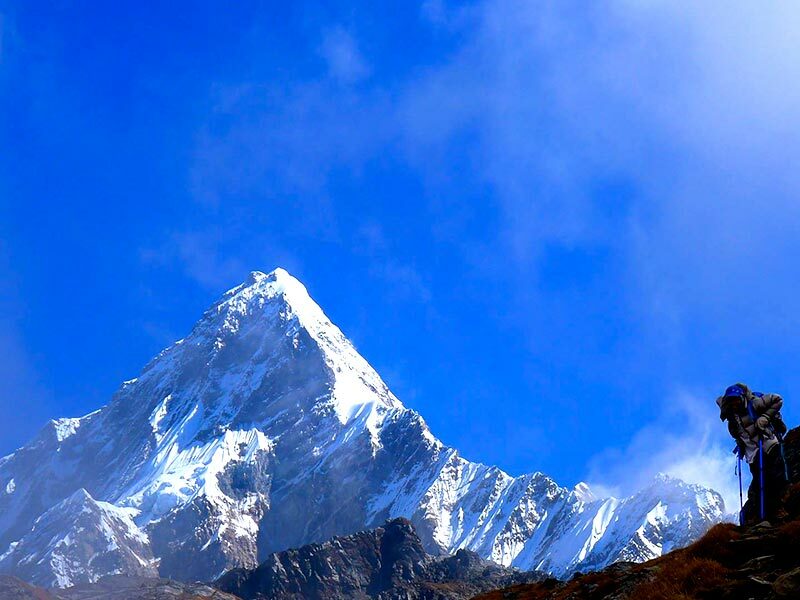 However, if you feel tired and no more interested to walk then you will have a flight from Jomsom to Pokhara. Day 1 Drive to Besisahar. Morning after breakfast at 07:00 hours drive to Besisahar. You will be at the point after 6-7 hours smooth drive, o/n rest. While driving, you can have beautiful sceneries over Trisuli river and villages along with landslide. Besisahar to Bahundanda ( 6-7 hours walking) – The first half of the trek follows the Marshyangdi river which divides the Annapurna Massifs. Keep on the west bank of the river and cross the bridge. Then walking up through terrace fields and forest to reach Khudi. The trial up the Marshyangdi valley gives excellent views of the Himalayan peaks. 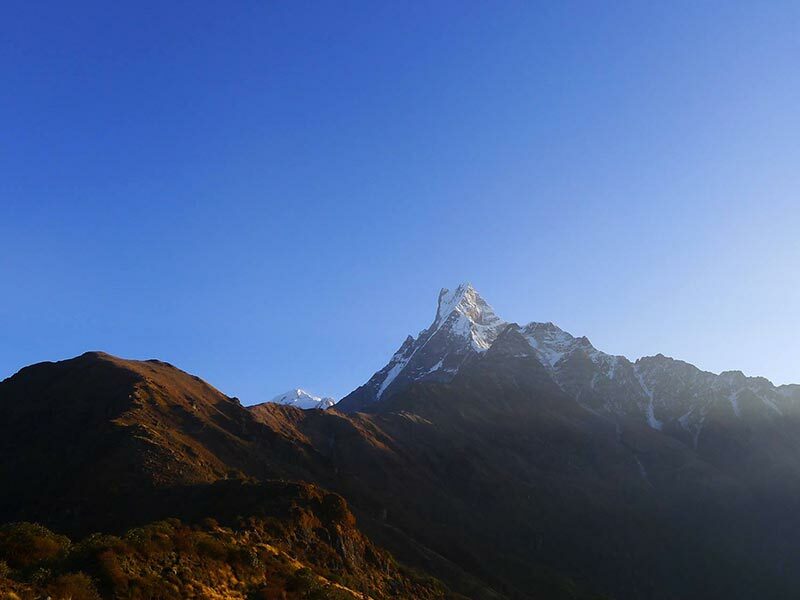 Dominating the eastern skyline is Manaslu(8156m), Himalchuli(7893m) and Boudha Himal ( 6672m).A steady walk then reach to bahundanda, brahmin village. Bahundanda to Chamje – From this point, the path drops steeply to Syange (1100m). After crossing suspension bridge and then trials climb high above the river along steep hillsides of rhododendron & pine forests to Jagat. After a kilometer walk, the path has reached to Chamje. Chamje to Bagarchap – Cross a broad flat valley, once a lake bed, through fields of corn, barely and potatoes, then climb steeply up a stone stairway to 1860m. The stairway then descends through blue pine forests to Dharapani, a Tibetan Buddhist Village then walking through rainshowed area to the north is Bagarchap. 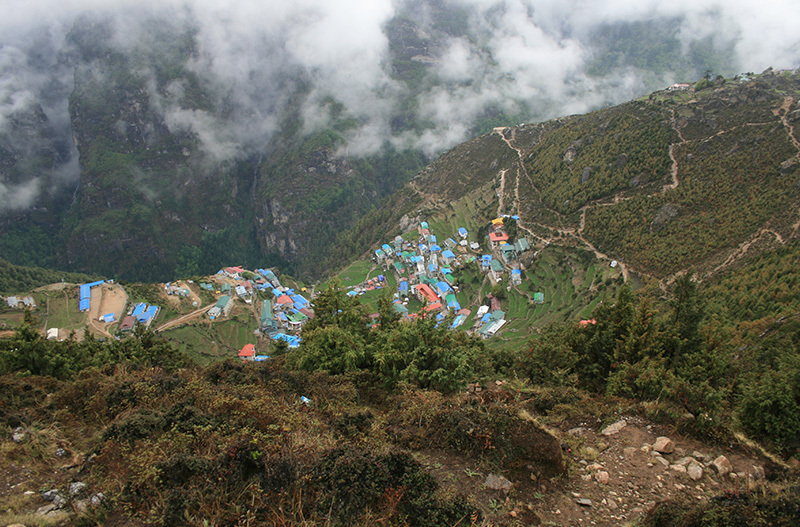 Bagarchap to Chame – Hike a rough and rocky trial through forest to Daneque and Tyanja. Kopar lies in a meadow between Tyanja & chame which has a post office, stay & bank. 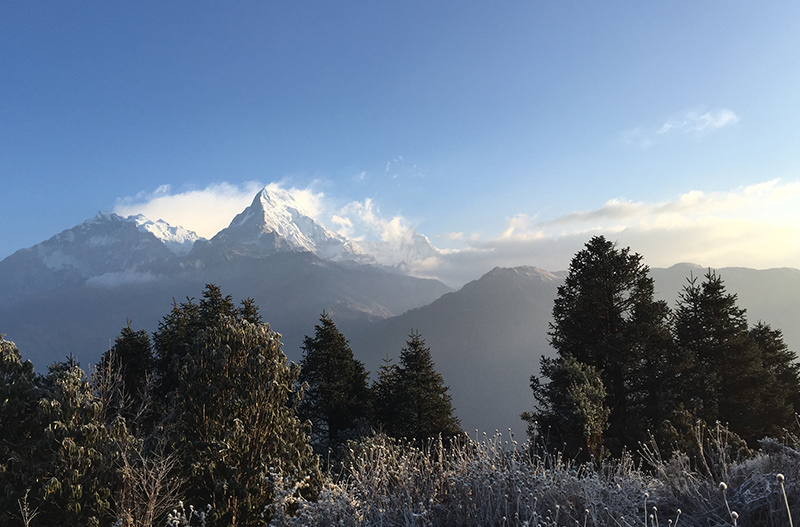 A fine and superb views of Annapurna II can be viewd from Chame. Chame to Pisang – In between the places the rain shadow effect can be seen as the forest become sparser and the density of juniper increases. The valley is steep and narrow and the path crosses the river twice. The trial climb further into the upper Marshyangdi valley and to Pisang. Pisang to Manang – The trial makes a long climb over a forested ridge that extends across the valley. At the top of this spur (344om) is an excellent view of the manang valley, with Tilicho lake at its head. After a short descent, the trial reaches the broad valley floor which is mostly used for grazing sheep, goats, horses and yaks. Across the river, high on the northern bank, is Ghyaru. 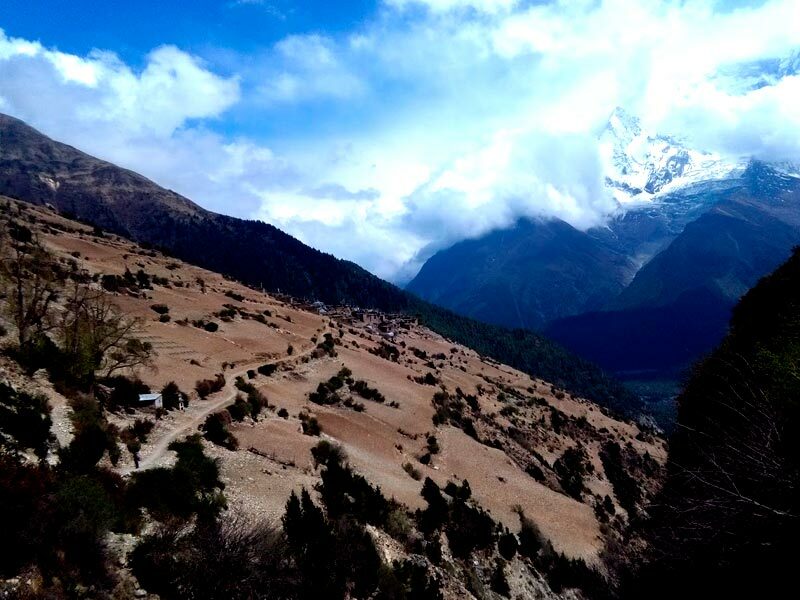 A short climb then leads to the plateau of Manang Village. 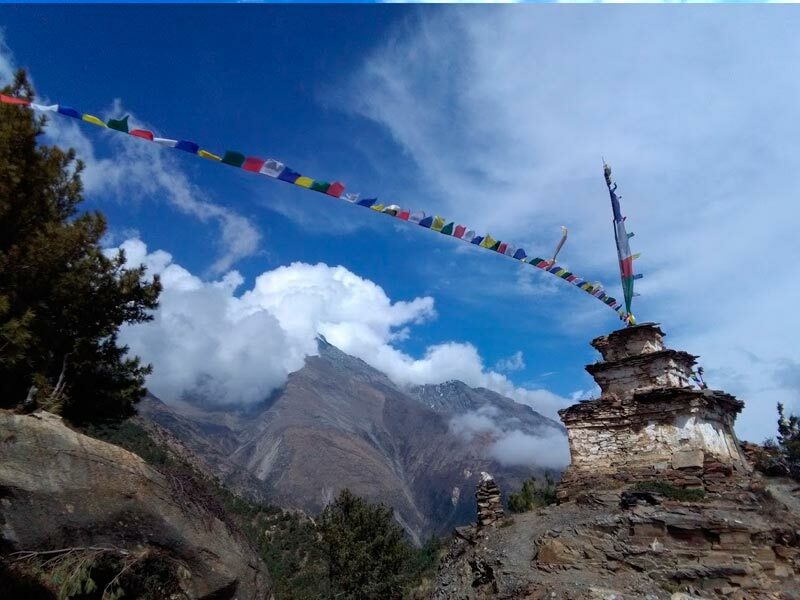 Manang rest for acclimatization – You should spend the day in Manang village and the vicinity to acclimatize to the higher elevation you will encounter towards Thorung-La. 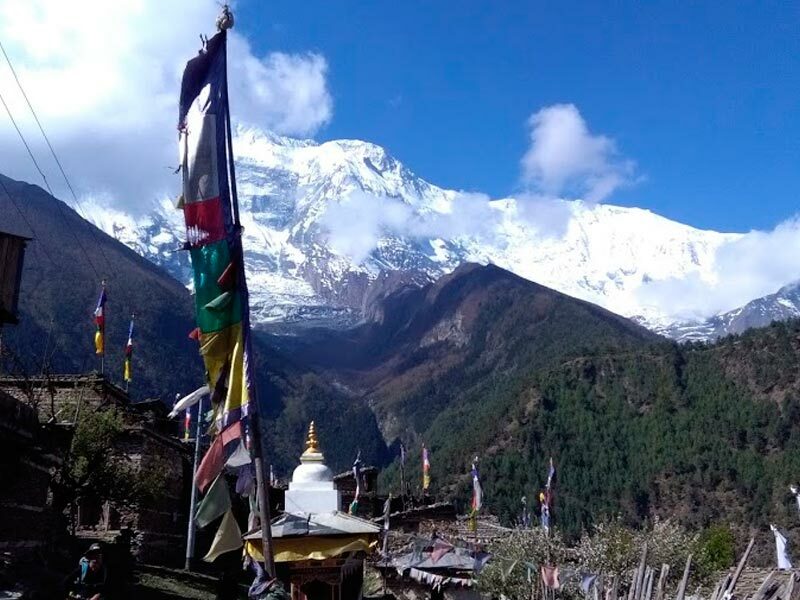 One can have a day excursion after climbing to the north village for magnificient views of Annapurna IV , Annapurna II and Tarke Kang or descend from the village to the glaciel lake at the foot of the huge ice fall that drops from the northern slopes of Gangapurna. 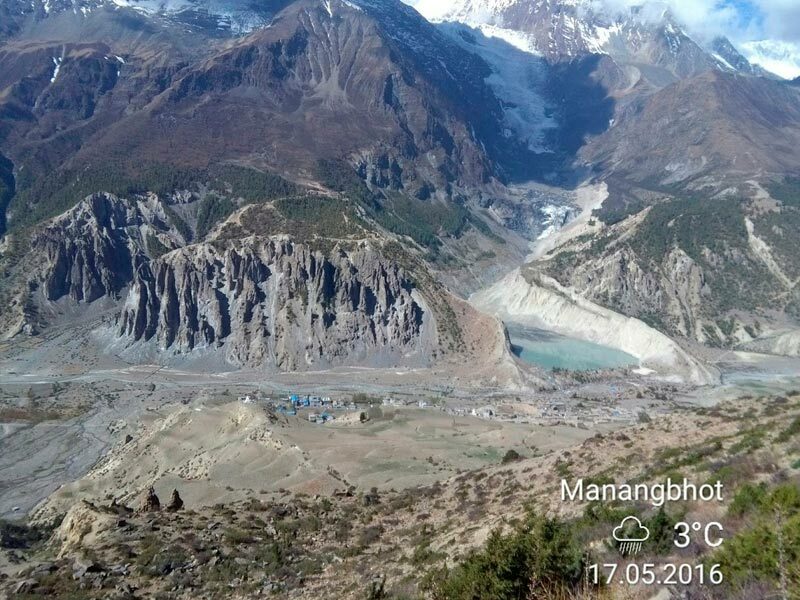 Additional, you can have a strenuous climb south of Manang to point 4695m. 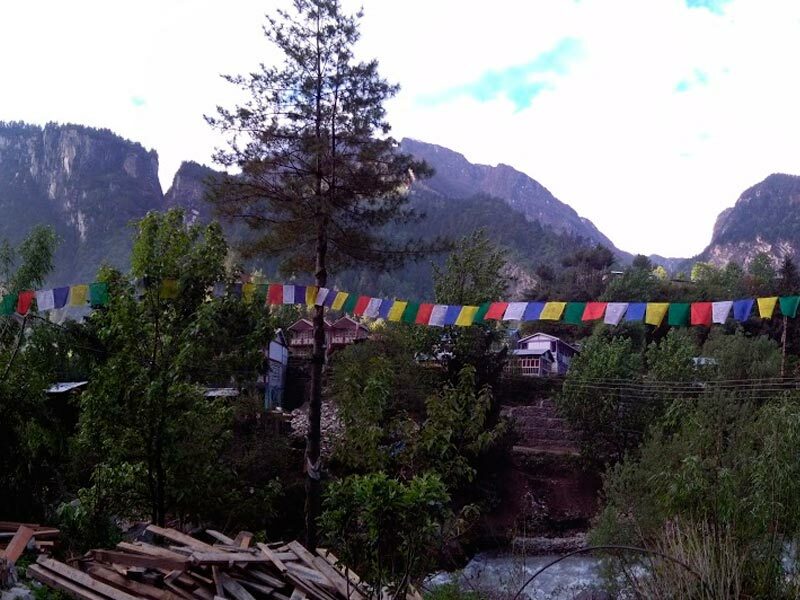 Manang to Chauri Lattar – (4 to 5 hours) –The trial crosses a stream, climbs to Tengi, then continues to climb out of the Marshyamgdi valley, turning north-west up the valley of Jarsang Khola. The passes goes then through juniper and alpine grasses. Chauri Lattar to Thorung Phedi (2-3 hours) – From Lattar the trial continues to climb along the east bank of Jarsang Khola then descends and crosses the stream on a wooden bridge and make a short ascent on a good trial. The trial then follows a narrow path across a high, unstable scree slope and descends to phedi. 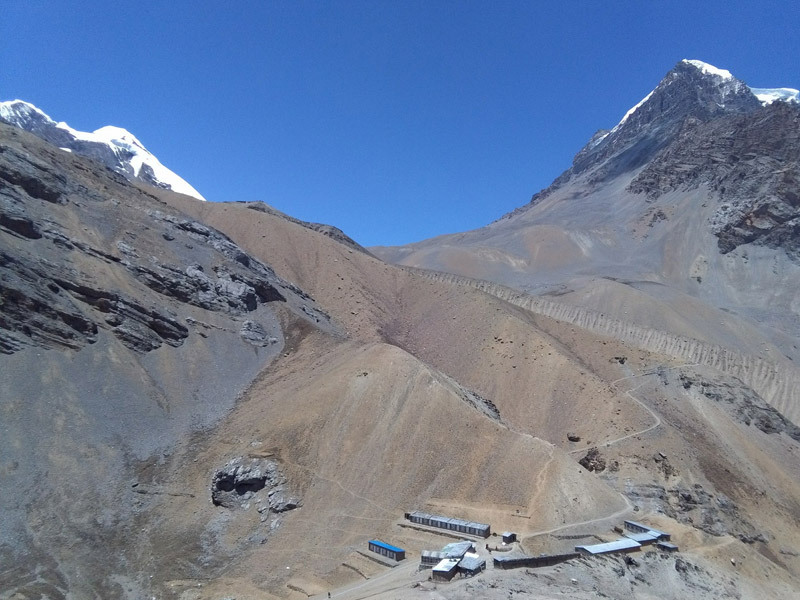 Thorung Phedi to Muktinath (6-8 hours) – The trial becomes steep immediately after leaving phedi, switchbacking up morains and following rocky ridges as it ascends to the pass. The trial is well set up as it is used by locals for many years but some complication may arise due to high elevation and snow. The pass is usually snowbound from mid December to late February. Sometime due to unseasonable storm the path may block, however, our experience guide will find a trial to make the journey smooth. 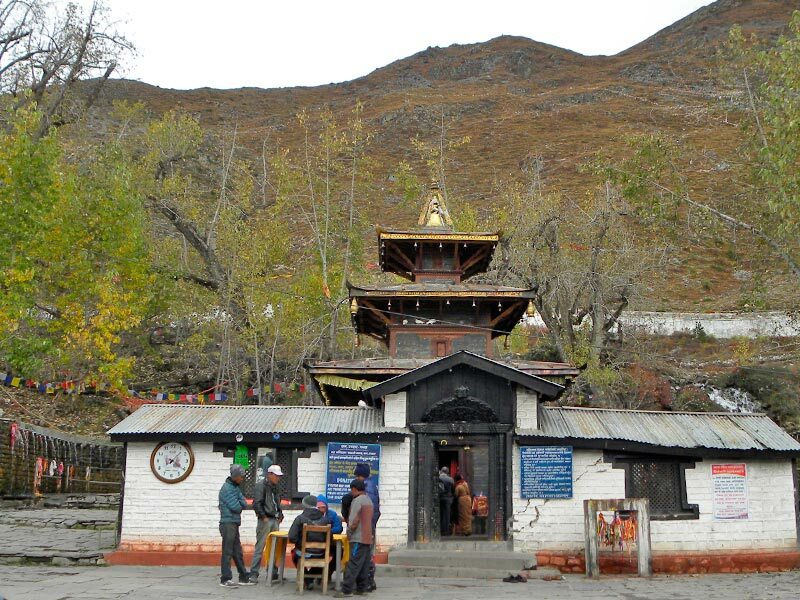 Muktinath-Jomsom – Muktinath temple is a shrine of Hindus and Buddhist. The temple is built in the pagoda style dedicated to Lord Vishnu or Avalokiteshwara as the Buddhist call him. May of the devotees from Nepal as well as India frequently visits the shrine. 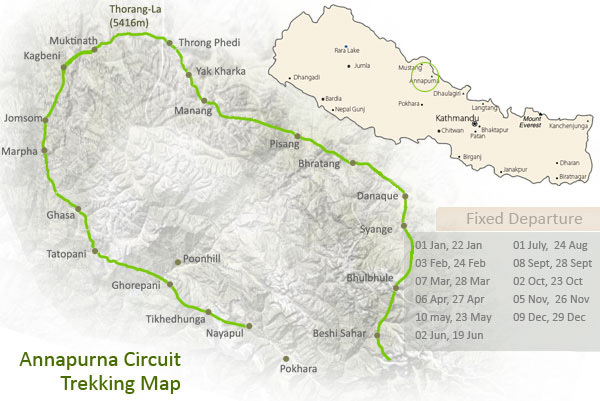 The trial from Muktinath then goes to Eklebhatti and to jomsom. 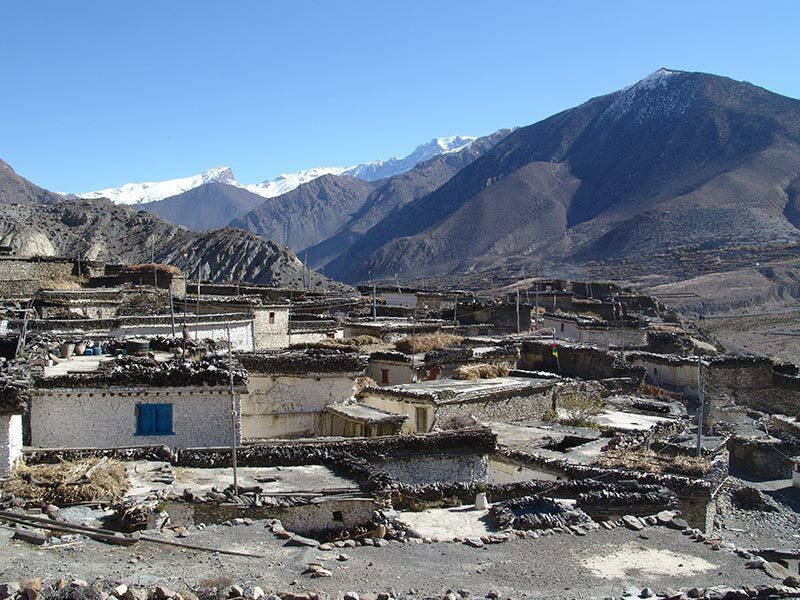 Alternatively, one can have a good walk over to Kagbeni and the next day to Jomsom. Jomsom to Pokhara- early in the monrning after breakfast you can fly to Pokhara and transfer to hotel. The Pokhara city can be explored on the same day. Alternativel, one can have a driving from Jomsom to Tatopani for further trekking to Ghorepani and to Annapurna Base Camp.